Photo by Teresa Isasi ©Newmarket Films 2010. All rights reserved. ©Newmarket Films 2010. All rights reserved. "I think it is more and more important to trust collaborators. It is important to have a good cast of collaborators and not impose a sole vision, no matter how clear in your own mind things might be." Award-winning Director Alejandro Amenabar brought Production Designer Guy Dyas and Set Decorator Larry Dias SDSA to the other side of the world to help unveil the little known story of the brilliant 4th century astronomer & mathematician Hypatia and her fight to save the wisdom of the Ancient World and the famous Library of Alexandria. Dias and Dyas converse with SET DECOR re: the fascinating unfolding of this ancient world and its congruence with today. 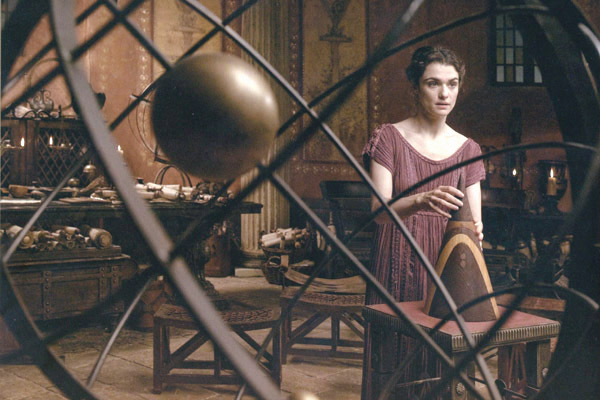 The story of Hypatia, one of the most renowned astronomers and mathematicians of her time, is a part of our history that hadn’t been told in film before. Director Alejandro Amenabar wanted this film to be a voyage through time and space, a historical recount that also speaks to us about the present day and how humans and civilizations keep repeating their mistakes. Alejandro is an exceptional director and he takes on many roles—he writes, directs and very often composes the music for his films. It’s quite unusual for European directors to come to Los Angeles to hire key crew, but from the very start, Alejandro conceived this film as an international co-production. 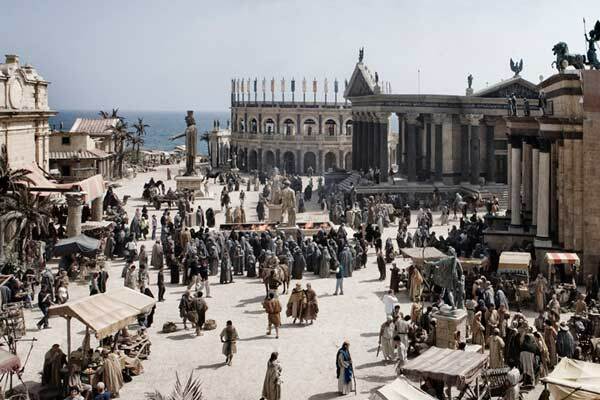 I enlisted my frequent collaborator Set Decorator Larry Dias SDSA, and together we set out to put together the team who would be entrusted with re-creating the legendary city of Alexandria circa 400AD. Pre-production took place in Madrid, while the film was entirely lensed in Malta over the course of 5 months. By Spanish, and even by Hollywood standards, the physical side of this production was impressive. SET DECOR: Your collaboration in conveying ancient & mythical structures for INDIANA JONES & THE KINGDOM OF THE CRYSTAL SKULL seems a natural prerequisite for the re-creation of the great 4th century cultural center of Alexandria. This time, though, it’s in the cradle of civilization at the decline of the Roman Empire. How did your preceding work help you prepare for this film? Designing a second film back to back with Larry was a huge asset. AGORA is a very ambitious film, and the trust and shared experience you accumulate with your key crew becomes vital on challenging projects like these, especially when you land in a distant location. Like me, Larry had to rely on his ability to adapt quickly and lead a foreign crew. The fact that we already had a shorthand between us really helped, no doubt. We chose to set up the production on the island of Malta in order to capitalize on a disused fortress at the edge of the sea. We both realized very early on that we were going to have to be extremely resourceful in order to fulfill Alejandro’s grand vision and to re-create 4th century Egypt within the constraints of our budget. I can truly say that having Larry on board made the task more manageable! Even though INDIANA JONES was obviously a different genre of film, it did have its historical aspects, and as Guy pointed out, it was beneficial for AGORA because we had developed a language in how we get things done. Guy is an incredibly hard-working designer who has his hands and eyes on everything. He is very collaborative and encourages me and my department to bring things to the table, whether it be research, found items or concepts that can be incorporated into key set dressing and/or story points. Guy fought very hard to get me on this European-produced project, which motivated me all the more to take it on with a vengeance. Initially, I had hoped I might be able to bring a few key people I was accustomed to working with, but as it turned out, I went alone and did the film in the European method—I oversaw all props, including action props, ran a staff shop, sculpting, paint, greens, carpentry and prop manufacturing departments. We dealt with all the animals, including Egyptian Ibis imported from Africa, and created the tack for the horses and camels in the film. Alejandro’s comment about collaboration is the absolute truth—he had complete trust in Guy and he immediately trusted me. He is a dream to work with—gentle and sincere, yet very clear and concise about what he wants. He treats everyone with grace and respect, which I find brilliant because it inspires the crew. There is nothing I or anyone on the crew would not have done for him—the common goal was to give him anything he asked for. 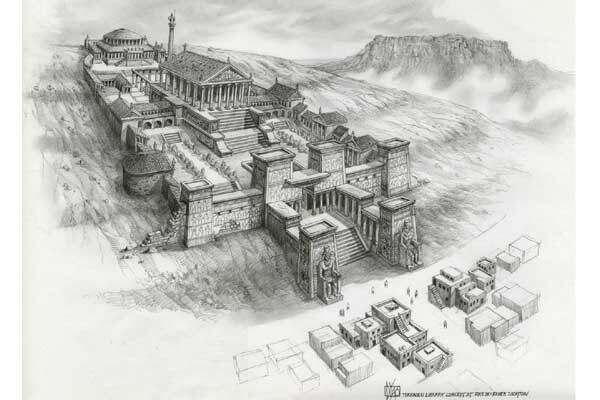 Both projects had their unique set of challenges, but by its own nature AGORA required far more in depth and scholarly approach to the original historical material. Alejandro wrote the script, as well as directed. During several years, he researched his story by immersing himself in archives and history books. He spoke to astronomers and traveled to the city of Alexandria with his producer Fernando Bovara. For me, the design process for this film had also begun prior to joining the project. Alejandro provided me with his script a year before the start of pre-production…I was able to let our ideas flourish and really have the entire look of the film in my head before we started pre-production. Adding to the extensive research accumulated by Alejandro and co-writer Mateo Gil, Dominique Arcadio Dyas compiled an immense amount of research that made us sort of layperson experts in the field. With such a grasp on all the dressing and props being used in the film, Dominique took on the role of on-set Art Director—a huge asset to our Set Decoration and Property department. I was also blessed with a brilliant European crew. I was introduced by my property master, Graeme Purdy, to Lisa Chugg from London, who came on board as the assistant set decorator. She was a sort of mentor to me in the ways of European filmmaking. She is wonderful to work with, dedicated to the project, with an impeccable eye. She made my transition into this new process seem effortless. How did you convey the time period and this great upheaval through the sets? 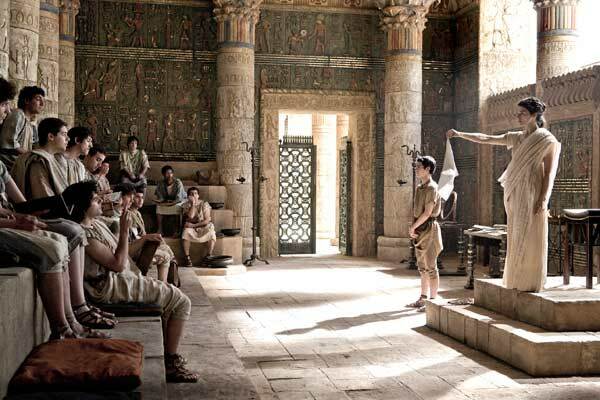 Alexandria was built on knowledge, and at its heart was the greatest library of Antiquity. It formed generation upon generation of scholars, philosophers and inventors who made huge advances in mathematics, geometry, astronomy and medicine. There were actually two generations of the library. The first was burned during the time of Julius Caesar. Here we tell the story of the second, and of Hypatia, a scholar who fought to preserve it from destruction. Alexandria was a cosmopolitan city, a mix of cultures and languages, so we really felt that this needed to be reflected in the architecture. Sadly, hardly anything is left today in Alexandria from that ancient period. Also, there are few historical records of the buildings that formed the library complex, but we do know that it coexisted with the older architecture of the city. We constructed our library to be next to an ancient Egyptian temple. We built extensive sets that mixed traditional Greco-Roman esthetics with Egyptian architecture and other influences—that’s the way cities evolve, even today. To convey the sense of tension and the growing possibility of Alexandria’s collapse through religious wars, we opted to use an array of architectural styles that purposely created clashing esthetics. The ancient Egyptian structures are shown deteriorated and falling into decay, their facades are painted in faded colors to mimic the bleaching of the Mediterranean sun. We imagined that 4th century Alexandria offered its residents the same abundance and accumulation of art and architecture as modern day Rome. From a decorating perspective, we dressed, then redressed sets symbolic of the decline of a sophisticated society that then digressed to a level of barbarism. 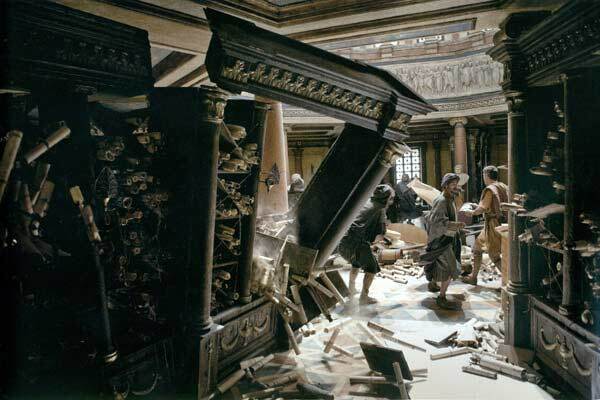 The Library was taken from its glorious pristine state as a place of higher education and literally destroyed on film by the Christian mob, which was a bit painful to watch in person. The next time we see it, it is a deserted place of early Christian worship that is in shambles and infested with nesting pigeons. 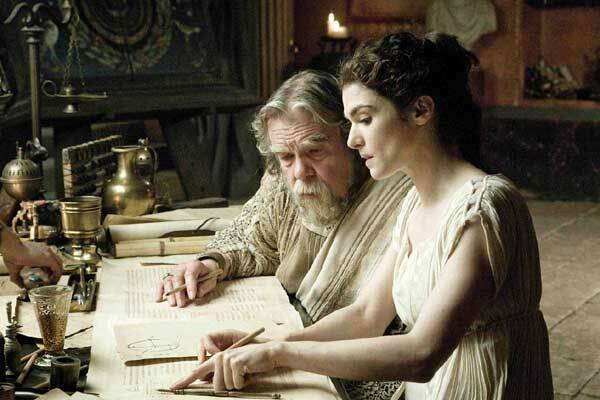 Hypatia’s classroom becomes a stable with goats and sheep occupying the steps where her students formerly sat. 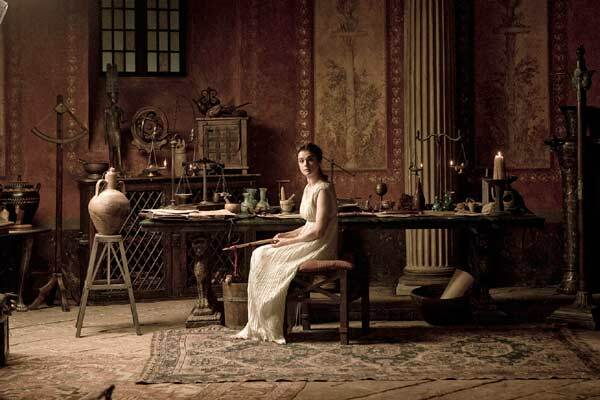 What I find most fascinating is the timelessness of the story of Hypatia and Alexandria, how this type of thing still applies to situations in our world today. We still have groups and cultures that feel their existence can be threatened by the knowledge or advancement of another culture or religion. 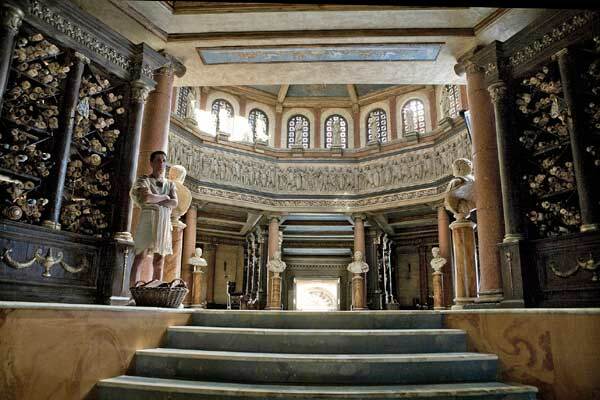 SET DECOR: Historical accuracy…please tell us about working with experts on the Ancient World. I met historian Justin Pollard prior to working on AGORA, when I was designing ELIZABETH: THE GOLDEN AGE in London, for which he was the historical advisor. I soon realized that his area of expertise extended far beyond 16th century England. During one of my early concept meetings with Alejandro, he mentioned a book that he was reading, the incredibly detailed THE RISE AND FALL OF ALEXANDRIA. I had also read the book. Justin was the author! Shortly after that, I introduced Justin to Alejandro and he became our historical advisor on set. Besides portraying the living, spiritual and political environments, we also manufactured the Apollonian cone and all of the scientific instruments. Often, obtainable research can be very difficult to verify—is it actually representing the correct period? For example, Victorian paintings that beautifully depict domestic life from the era but are rife with improper period details—so it was invaluable to have Justin and the other experts available to answer questions and guide decisions. Please tell us about creating this, from vision to essence to physical reality. Guy is a genius with the pencil! His remarkably detailed drawings facilitate my job by removing a lot of guesswork. 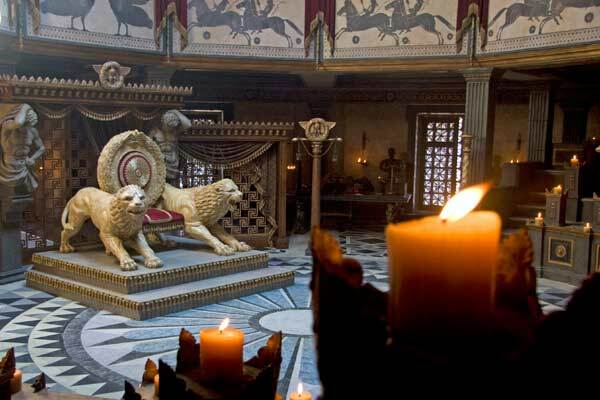 Orestes’ throne is something he came up with after we had gone through some research trying to find examples of thrones and of lions that were carved in a very specific style. He took bits of research away with him and later that afternoon showed me an amazing sketch. The sketch was given to Roland Stevenson*, my sculptor, who then sculpted the mirrored-image lions and the wreath seatback. The gilded-thread embroidered cushion was hand stitched in India. At the beginning of pre-production, we agreed that all of the statues over two meters would be the responsibility of the Art Dept, while anything under would be Set Decoration. Surprisingly, the number of statues that fell under two meters was well over two hundred! I got more than a little pleasure ribbing Supervising Art Director Frank Walsh about how a lot of statuary seemed to hit just at the 1.9 meter mark! 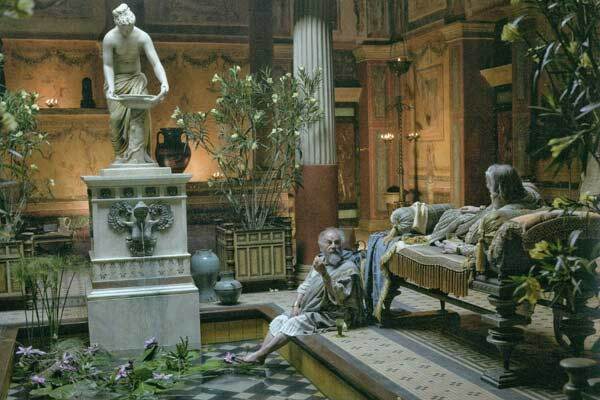 Most of the statues were complete sculpts, with a small number of them rented and brought in from CineArs, a wonderful staff shop stuffed to the rafters in Cinecittá in Rome. The scrolls and codices were all manufactured by hand with the interiors designed by Graphic Designer Trey Shaffer. It was a sight to behold in the workshop—miles of paper being hand-dipped and hung to dry, then hand-lettered by Maltese calligraphers. Since we had so much action in the Library, the scrolls had to have text so they could be used as action props. The library shelves were built in my carpentry shop with the moldings sculpted by Roland and his crew, then gold leafed and aged by my paint crew. Because they were to be destroyed on camera, Art Director Charlo Dalli drew them to be built in a traditional way so they would appear properly built when pushed over by the mob. Toni Murer and Luca Giampoli* manufactured the most beautiful sconces in a hand hammered brass that were mounted on the shelves. They were truly exquisite. 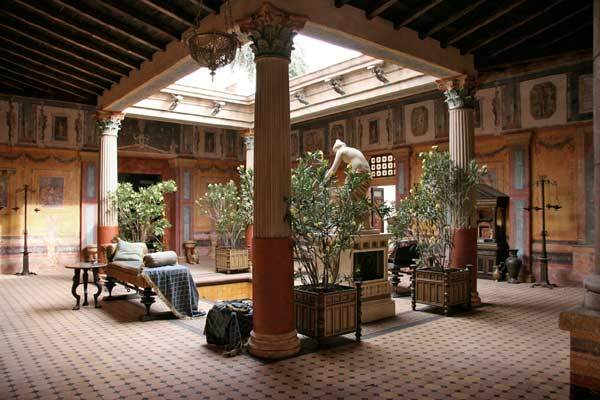 The furniture in Theon & Hypatia’s set was mostly brought in from Rome from Rancati, an exceptional family-owned prophouse that has some beautiful Roman furnishings and lighting. I also rented Italian and Egyptian furnishing and lighting from various hire companies in London. We built the planters and fountain statue from research—I love the intertwined winged female figures that hold up the rain gutters meant to collect the rainwater to fill the pool. The astronomic and scientific instruments were manufactured by my prop-making crew, based on research compiled from science museums in Paris and Florence. The table bases were rented from Rancati. We manufactured the table tops and my amazing Italian painters applied an incredibly realistic marble faux finish on them. The floor tapestries are from Eccentric Hire Co. and Farleys in London. The smalls are from hire companies in London, Paris, and Rome. SD: What about access, the shipping & transportation of set dressing & materials? All of our set dressing was trucked from other parts of Europe to Italy and then brought over to Malta on barges. On Malta, we used flat bed trucks to transport the dressing from our shop, a twenty minute drive away. Most of the fabrics were brought in from London and Rome. 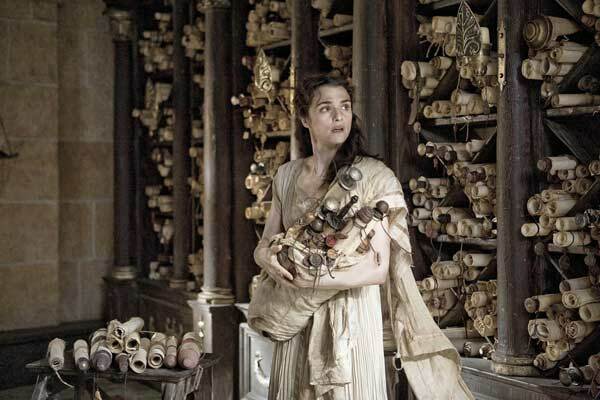 We also bought bulk amounts in Florence at OB Stock, a source given to me by Gabriella Pescucci the costume designer. A phenomenal place. SD: Challenges particular to this film? They are endless! It is one of the most enriching experiences I have had. It started out feeling like I had taken on something insurmountable and ended up being a film that I am really proud to have worked on. I also made some new friends, people that will remain in my life always. Flexibility and trust in one’s crew are the key factors when working remotely. Actually they are the key to working anywhere. 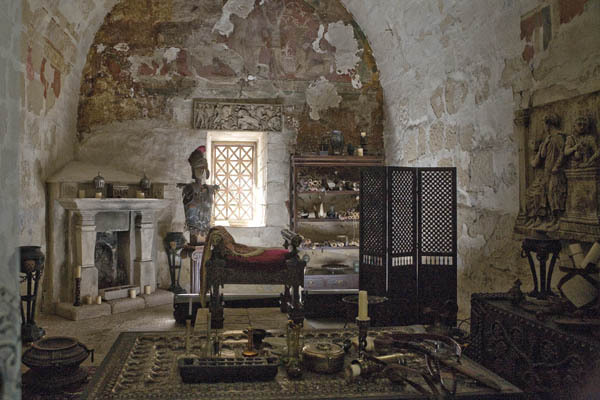 The level of “old world” craftsmanship that exists in Malta is amazing. I had leather workers, calligraphers, bookbinders, glassblowers, wood carvers, sign painters and wheelwrights. Gaia Zambelli from Rome and Lucy Van Lonkhuyzen from Dublin were my buyers. Gaia was integral to our shopping trips and making production rental deals in Rome. Lucy has done some great work on period films in Europe and was a huge asset to me. Roland Stevenson from Scotland was my senior propmaker/sculptor and is an exceptionally gifted sculptor, who along with Sophie Tarver, the mould shop supervisor, made for an unbeatable team. My prop shop was supervised by Toni Murer, along with Luca Giampoli a third generation Italian Mint trained metal worker who made metal seem completely fluid. My lead painter from Rome was Vittorio Di Persio, a man that can paint the most amazing faux marble and verdigris finishes I have ever seen. My drapers, Mauro Masotti and John Gouder, produced exquisite drapery from a leaky cavern of a workshop. My greensmaster, Danilo Rossiello, is the second generation of a greens family in Rome and was brilliant. I started out with a driver, Ruth Ancilerri. It turns out she was an awful driver, but could draw beautifully! She became my junior draughtsperson, at which point I learned to drive on the “other side” of the road.